On roadsides, woodland margins, in hedgerows and shady places, from April to June this tall, downy perennial stands gracefully, reaching up to 1 metre at times. 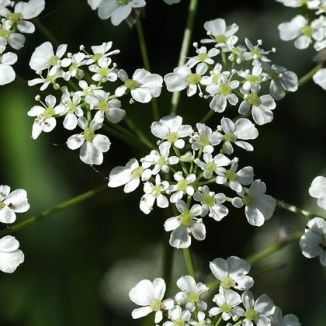 It has a stout, hollow, grooved and unspotted stem on which it bears long-stalked terminal umbels of white 5-petalled flowers. These inflorsecences have 8–12 stalks and are without bracts. The bright green leaves are quite large, triangular and 2-3 times pinnate. The seeds are black and elongated. 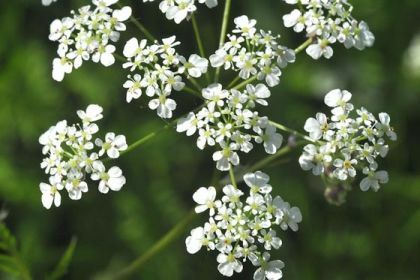 Also known as Devil's Parsley, possibly because of its resemblance to the highly poisonous Hemlock, this plant occurs in accounts of withcraft practices. It is a native plant belonging to the Apiaceae family.